Hiv/Aids, a Vatican point of view Will Saint Raphael heal the Church? «Catholics are not even allowed to think». This thought does not come from the corridors of the Vatican Secretariat of State. There is a whole world made up of Catholics that are not – and that do not intend to be – part of the Vatican Hierarchy. This world is inspired by Christian values and aims to put into action the Social Doctrine of the Catholic Church. At the same time, this world is not directly inspired by political, ecclesiastical or any other kind lobbies. It is a hidden world. No surprise that, when this world come to a light, its aims are mispresented. Can it be definied a Modern Kulturkampf? During the second half of the 19th Century, right after the First Vatican Council, the German Chancellor Otto von Bismark launched a struggle against the Catholic Church. He failed. But this struggle still echoes in German society. A couple of years ago, when a referendum about the teaching of religion at school had been promoted, some observer talked about a renewed kulturkampf. It seems evident to many Vatican insiders that there is still a struggle against the Christian thought, and recently two cases seemed to have once more proved it: the disinformation campaign against Timo Soini, the Finnish nationalist party leader, and the disinformation about the new Hungarian Constitution, that begins claiming at the Catholic roots of the country. If then one would make a more in depth analysis of Western Parliaments composition, he would notice the lack of influence of the Catholic parties. Italy is not an exception. After the disappear of the Democrazia Cristiana (Christian Democracy), Catholics politicians had been scattered in several (and different) political parties. 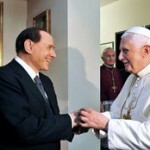 Usually, it is thought that Catholics are closer to Berlusconi administration, and affiliated to the center right. But there are Catholics among the Italian center-left parties, too. Their voice is always hidden. Catholics’ spokesmen had become exponent of Christian laissez-faire liberalism or devout atheistic (this is how atheistic that speak considering the thought of the Church had been labeled). The last 29th of June, a dinner took place at the Istituto Salesiano del Sacro Cuore di Gesù in Rome (a Salesian institute). Catholic politicians, young people, member of ecclesiastical movement sat at the same table to talk about the education of a new generation of Catholics politically and socially committed, and about what could be the space for this new generation in the Italian parties. This dinner has been interpreted as the signal of a opposition between the Vatican Secretariat of State and Italian Episcopal Conference. Isn’t it true that Cardinal Bertone wanted – and still wants – to be himself the leader of the Italian Church «in regard to relations with political institutions»? When on March 25, 2007, Bagnasco took office as president of the CEI, it was Bertone who wrote as much to him in black and white, in a public letter. 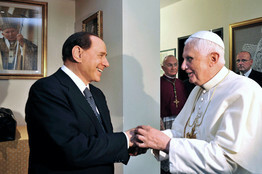 Bertone hadn’t even notified the pope about the letter. Many wrote – and thought – that 29th of June meeting was intended to put the basis for a new Catholic party. It had been called the Cosa Bianca, the White Thing, a name that remembers the colour of Christian Democracy. The aim was to promote «a new thing», rooted in the Social Doctrine of the Catholic Church. There had been only a «political» question: wheter if the scatter of Catholic politicians in several parties is something positive, or if Catholics need to find some political unity. There is no aim to break up Catholic world. The contrast between Italian Episcopal Conference and the Secretariat of State was not part of that meeting. In fact, cardinal Bertone did not take part to the 29th of June dinner. There were both center-right and center-left Italian Catholic politicians (Beppe Pisanu, Paola Binetti, Giuseppe Fioroni, Lorenzo Cesa, Rocco Buttiglione, Savino Pezzotta), exponents of ecclesiastical movements (Sant’Egidio, Focolarini, Rinnovamento nello Spirito, Agesci, Azione Cattolica, Acli), the chaplain of the Chamber of Deputies mons. Lorenzo Leuzzi. There were also teachers and young people. And in that occasion the conference about the Catholics in Europe had been launched. The way to the conference was quick and intense. There had been other meetings before, during the ones Catholics of different belongings and politicians agreed on the importance to give birth to a movement of action and reflection, moving from the appeal of the Pope for a new wave of Catholic politicians. This was sufficient to let a part of Italian Catholic and political world tremble. Italian newspapers published endorsement to criticize the meeting. Articles outlining the invasive and strong blessing of the Secretariat of State on the meetings had been written down. And there were a certain discontent in Italian Episcopal Conference. «There is no ending for intellectual misery. Today, thinking together to educate a new generation of Catholic politicians has become a cultural crime, or lese-majesty», monsignor Mario Toso, secretary of the Pontifical Council for Justice and Peace, says. There had obviously some discontent among the participants to the meeting, especially when it had been clarified that there was no intention to endorse a new Catholic party. Italian Episcopal Conference, on the other hand, fears to lose the privileged relationships with the political world. Their project risks to fail. What is the project? «The problem – an insider source of Vatican Curia says – is not to discontent the politician bishops are linked to. The 8 per mille mechanism is too profitable for Catholic Church. But it is a system that tends to ‘blackmail’ the Church». According to Otto per mille mechanism, a part of the taxes paid by every Italian taxpayer is devolved to either the Catholic Church or some other organisation -State included. However, if no other specific group is selected as an Otto per mille beneficiary, the money is automatically re-distributed into the several organisations -according to proportionality. So, the line is not to stamp the friends politician’s feet, and maybe thank for the Advance Directive Bill or – much better – for the cancellation of the tax it had imposed on those ecclesiastical properties which are not worship sites. The tax had been issued as part of a recent law regarding ‘fiscal federalism’, but also because Bruxelles was starting to investigate the matter. However, shortly before the Permanent Council of Italian Episcopal Conferecence of the last March (the meeting that a sort of ‘little Paliament of bishops’ holds twice a year), the exemption re-appeared. And, in return, the episcopal hit-out the opposition was waiting for never arrived. In this way, the Church lack in prophecy. Benedict XVI appeal for a new wave of Catholic politicians is based on the need to educate a generation rooted in the Social Doctrine of the Church. Bishops and priests must educate in the parrish. Christifideles laity are called to put into action the principles. «The Christifideles laity – the Pope said – in particular, cannot be solely passive beneficiaries but are the protagonists of the Church’s social doctrine at the vital moment of its implementation. They are also valuable collaborators of the pastors in its formulation, thanks to the experience they have acquired in the field and to their own specific skills». 20 Responses to Italy, is a modern Kulturkampf taking place? such as you wrote the guide in it or something. I think that you just can do with a few % to drive the message home a bit, but instead of that, this is excellent blog. An excellent read. I will certainly be back. favor”.I’m trying to find things to enhance my website!I suppose its ok to use some of your ideas!! Greetings! Very helpful advice within this article! It’s the little changes that make the most significant changes. Many thanks for sharing! Italian Church » Italy, is a modern Kulturkampf taking place? | MondayVatican. I do have a couple of questions for you if it’s allright. Is it only me or does it give the impression like some of these responses appear like they are written by brain dead folks? And, if you are writing at additional online social sites, I would like to follow you. Would you make a list of the complete urls of all your social networking sites like your linkedin profile, Facebook page or twitter feed? of lots of valuable data, thanks for providing such statistics. I am really inspired together with your writing abilities as well as with the layout in your weblog. Is this a paid subject or did you customize it yourself? Anyway stay up the excellent quality writing, it’s uncommon to see a nice blog like this one today..
I’m quite sure I will learn a lot of new stuff right here! Good luck for the next! and reporting! Keep up the good works guys I’ve included you guys to blogroll. I’m really enjoying the theme/design of your blog. Do you ever run into any browser compatibility issues? A number of my blog readers have complained about my website not operating correctly in Explorer but looks great in Safari. Do you have any suggestions to help fix this problem? There are so many options out there that I’m totally confused .. Any recommendations? Thanks a lot! Hola! I’ve been following your blog for a long time now and finally got the courage to go ahead and give you a shout out from Houston Texas! Just wanted to tell you keep up the excellent job! Thank you, I’ve recently been looking for information about this subject for a long time and yours is the greatest I have came upon till now. However, what about the conclusion? Are you positive in regards to the source?